Aris Raissis is one of the most in-demand fine artists in the UK. Known for reinvigorating the techniques of the Old Masters in the present day, Aris Raissis’ work is both timeless and classic. Raissis has been privately commissioned by collectors around the world, including royalty, and his original artworks have become highly collectible for their modern take on traditional techniques, incorporating elements of social realism and expressionism into his largely classical portraits, still lifes and figurative paintings. Visit our Aris Raissis artworks page to browse our collection of the artist’s work. Aris Raissis was born in Cairo in 1962 to Greek parents. 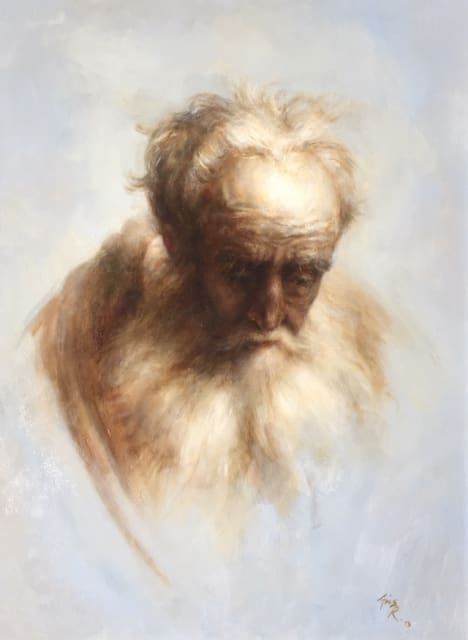 He took a keen interest in art as he grew up, and in the 1980s he studied at The Chelsea School of Fine Art and The Byam Shaw School of Fine Art, where he focused on figurative painting, still-life and portraiture. After graduating in 1985, Raissis began to exhibit his work. The Royal Society of Portrait Painters hosted a self portrait of his in 1986 and other prestigious London galleries began to take an interest in his work, also putting it on display at exhibitions. Raissis’ affinity for the styles and themes of the Old Masters brought him to the attention of British Federation of Old Masters Society, who commissioned him for portraits. Raissis also exhibited his work in world-renowned hotels, including The Dorchester, Claridges, The Mayfair, The Grosvenor and The Intercontinental. By the mid-1990s Aris Raissis had gained a fan in HRH Crown Prince Alexander of Yugoslavia, who commissioned the artist to paint a portrait. In 1995 the portrait was unveiled at Claridges in London, with multiple Kings, Queens, and Heads of State from around the world in attendance, including Queen Elizabeth II herself. In 1997, Raissis completed another landmark work: his portrait of young woman in Middle Eastern garb, painted on location at Kensington’s Leighton House Museum. Two years later, Raissis’ “Arab Heads” was auctioned at The Dorchester in aid of the Children with Special Needs in Egypt at a gala attended by Princess Alexandra. In 2003 Raissis was a finalist in the “Not the Turner Prize” competition, which was a more traditional counterpart to the famously postmodern award. In 2010, Raissis became the Artist in Residence at Leighton Museum — the site of his breakthrough 1997 work. He continues to work on commissioned portraits from buyers around the world in Mexico, Italy, France, Spain, Norway, Switzerland, the USA, the UK, Greece and his native Egypt.